for posterity’s sake, i’d like to mention that sunday was one of the greatest days of my life. i got up at 7:30a to watch the wimbledon final between rafael nadal and roger federer. during the first rain delay, i went up to brian and gavin’s house. there’s was a big party, basically. i ate some waffles and then the rain delay was over. we watched a riveting 4th set. i couldn’t believe it. really. then there was a brief rain delay in the 5th set, and i played ping pong outdoors. which is nice because of how much space you have, but also kind of weird because you have to deal with the wind. i typed in “ping pong wind” into google, but it thought i said wind, not wind. 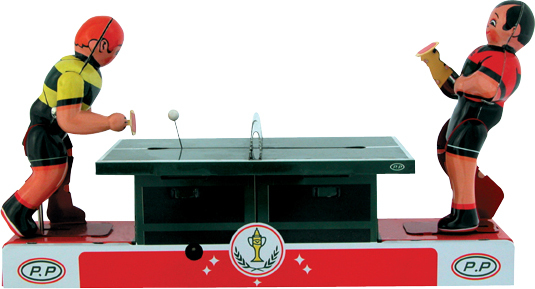 like a wind up toy ping pong, pictured below. when tennis started again, we went back inside and watched a fantastic 5th set that i was sure would spill over into the next day. but by some miracle, nadal broke federer and served out to win. there were so many incredible shots by both of those guys. i was really glad to see federer playing so well, especially considering that according to djokovic, federer was vulnerable after his french open loss. the main point is that this was more than just the best sporting event i’ve ever been a part of. for probably the only time in my life, i wasn’t disappointed by the athletes i love. i don’t get disappointed in them. disappointment isn’t the right word. but it does make me sad when they don’t play as well as i know they can. in basketball my favorite teams always lose, and they usually lose early. same in everything. but not with this wimbledon. if i’d planned wimbledon out, it might’ve been really close to this. i was glad to see all the early upsets: blake and roddick in the 2nd round; djokovic choking in the 3rd; sharapova in one of those early rounds. and i was really excited to see nadal and federer reach the final so convincingly. nadal only lost a set en route to the final and federer didn’t even drop a set. so wimbledon is supposedly the most sacred tennis event. i don’t buy into that, but according to people, this wimbledon victory for nadal is the best tennis result spain could hope for. and now spain is trying to do what boston couldn’t… win the championship in 3 major sports. the patriots lost to the giants in last year’s super bowl, so only ended up with 2 championships: the red sox in baseball and the celtics in basketball. basketball, baseball, and football are arguably the most popular american sport and boston is one of the favorite cities, despite a history of racism. but they only got 2 out of 3. i’m trying to think of the top sports worldwide. obviously soccer is number one, and spain just won the uefa final. i think tennis is one of the top 3. and nadal just won two straight majors for spain. maybe basketball is becoming more of a world sport. at least the nba is trying to convince me that it is every chance they get. so all spain needs to do is win basketball in the olympics. and spain will be better than boston. i’m pretty sure most people already think spain is better than boston. except maybe scorsese. that departed movie was awesome. i found these spanish commercials last week. rafael nadal and pau gasol. the premise is that they’re going to be given these really great watches. but they have to perform some task. after they fail, the lady tells them that they can only have the watches if they give up sports. then they hang out on the beach, making margaritas and telling girls what time it is using their sweet watches. not the best commercials. i wish nadal would only ones like that commercial from last year’s us open. which reminds me, i’ll be very interested to see how he fares in the us open. he’s on like a 26 match winning streak but has never been able to get it done on hard courts. so maybe this will be the year. aaron did you sign in as brian? do you know everyones password?